How to Convert MPG Files to MP4 Online? How to Change MPG to MP4 on a Desktop? MPEG is a set of standards developed by and named after the Moving Picture Experts Group. The most popular formats in this class are MPEG‑1, MPEG-2, and MPEG-4. Generally when someone talks about an MPEG format, they mean MPEG-1 or MPEG-2. Files in these formats usually have the .mpg extension. Although MPEG videos are widely used, the majority of tablets and phones don’t support this format. To make sure your movie will play on your device, you’ll probably need to change the format from MPEG to a more widely used format like MP4. You could look for freeware to complete your conversion tasks, but a much easier way is to convert MPG to MP4 online. Try using our online conversion tool. 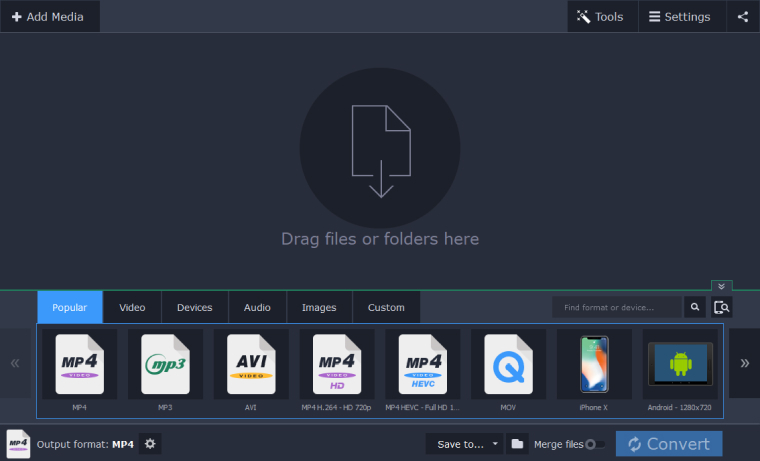 It works with the majority of popular media formats, and the converted files have no restrictive watermark. Follow the steps below to learn how to use this free MPG-to-MP4 converter. Select MP4 as the output format. Your MPG file is over 100 MB? Try our premium desktop app! How to Change MPG File to MP4 on a Desktop? 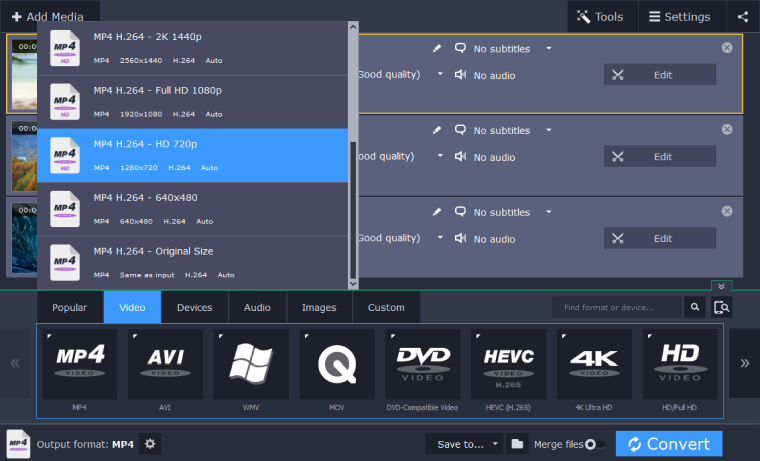 SuperSpeed Video Converter supports a huge selection of media formats, including MP4, AVI, MOV, and many more. It makes conversion really easy, even for a beginner. Download the installation file for Windows (XP/Vista/7/8/10) or Mac OS X (10.7 or higher) and follow these steps to learn how to convert MPG to MP4 or vice versa. Launch the downloaded file and follow the installation instructions. When the installation is complete, double-click on the program icon on the desktop to start the software. Click the Add Media button in the top left corner, then select the Add Video option. 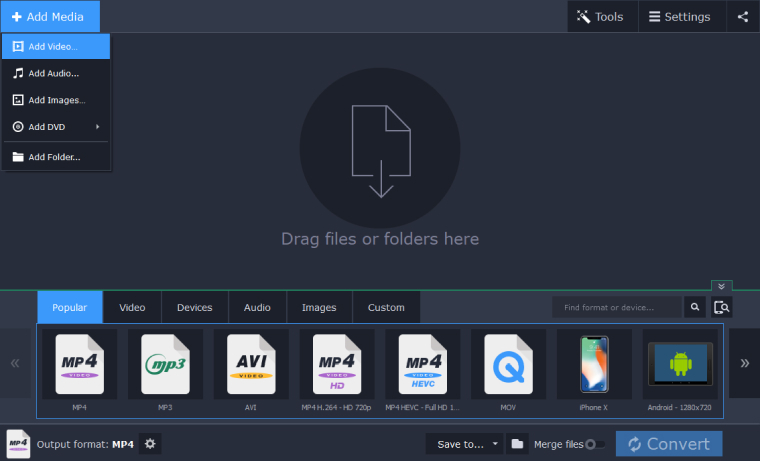 In the new window, find and select the MPEG file you want to convert, then click Open. All the selected files will be added to the program. In the Video tab, locate the MP4 profile group and choose the profile that best meets your needs. If you want to convert MP4 to MPEG, locate the MPG profiles and select one of the available presets. Select the folder in which to save the converted files by clicking the Directory icon in the lower part of the program screen, browsing to the desired destination, and clicking Select Folder. Then click the Convert button to launch the process. The SuperSpeed feature means the processing is really fast, so you don’t have to wait for your results. That’s it for the SuperSpeed MPEG-to-MP4 converter. Thanks to its intuitive and easy-to-understand interface, changing formats with this program is really easy. Just give it a try! Copyright 2019, Movavi Software Limited. All rights reserved.